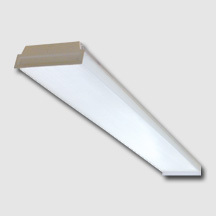 Low profile, narrow, 4 light fluorescent wraparound perfect for commercial spaces, schools, dormitories, offices and retail spaces. All fixture parts snap together for ease of installation and maintenance. Housing accepts lift-and-shift prismatic lenses and frames that fit flush to the ceiling. Housing constructed of die-formed heavy gauge steel. Side flanges add maximum rigidity.